Teens with the Marquette University Golden Eagles mascot at the Leadership and Brotherhood Summit for Young Men of Color. Marquette University hosted a summit Thursday meant to help young black, Latino and Native American men succeed in school — and life. The event theme was developing brotherhood among young men of color in Milwaukee and participants came from public schools across the city. 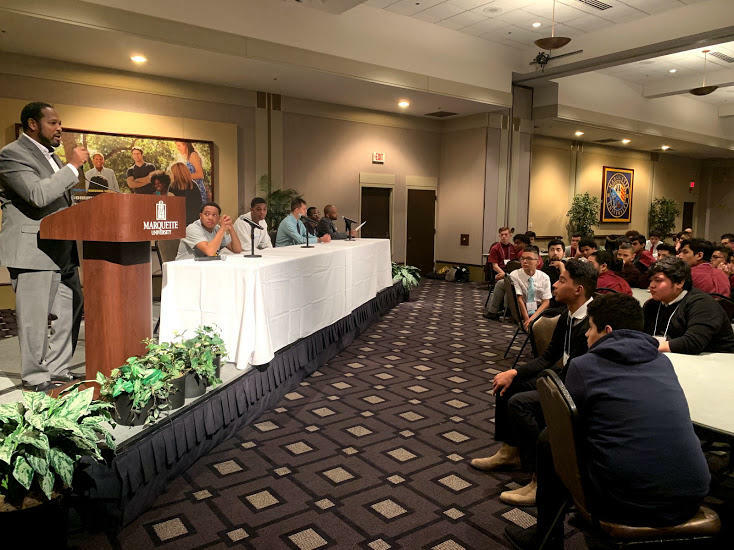 The Leadership and Brotherhood Summit for Young Men of Color included more than a dozen breakout sessions, addressing a variety of topics that impact black, Latino and Native American teens. 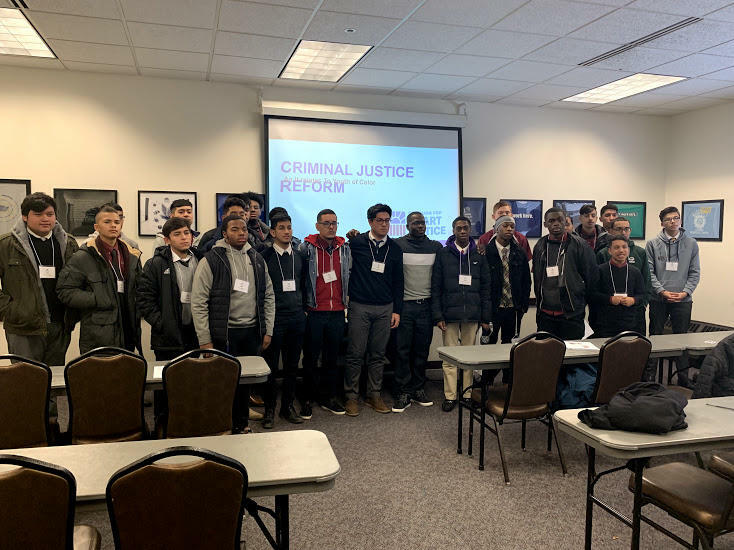 Sessions included college for first generation students 101, becoming a young man of color with positive influence and criminal justice reform as it relates to youth of color. More than 200 young men made their way to the Marquette union for the opening session where acting provost Kimo Ah Yun gave a welcoming speech. During which he invited the students to join in a university cheer. Ah Yun also gave the students advice on how to make the most of the summit experience. “The relationships you’re going to make today and moving forward … it’s about brotherhood. It’s about lifting one another up. It’s about using everyone else in this room to lift you up and when you do that you’re all going to succeed,” he said. 1st District Ald. Ashanti Hamilton also addressed the crowd. Alderman Ashanti Hamilton tells the young men how proud he is to be at the summit with them. “Boy, I am so excited to be in front of you today … because today is going to be a powerful day for you. So, I want ya’ll to get us started with some words of power. Can I just hear you all say, 'I … am … powerful,' ” he said. The summit was about a year in the making. It was a collaboration between Marquette and MPS’ Department of Black and Latino Male Achievement. Lanelle Ramey heads the department. He says it was inspired, in part, by the Summit on Black Male Youth-Milwaukee that’s been held the last few years. Sean Wilson is smart justice statewide organizer for the ACLU of Wisconsin. He presented the session on criminal justice reform as it relates to youth of color. Sean Wilson (center) poses for a photo with the teens after his presentation. During his presentation he gave some statistics facing young people of color in the criminal justice system. "one in three black males, and one in six Hispanic males will go to prison in their lifetime. African-Americans are incarcerated at more than five times the rate of whites. Nationwide, African-American children represent 32 percent of children that are arrested. You have been labeled before you are even born that you are going to prison," Wilson said. I spoke with a few of the young men who were also at Wilson’s session – all are 16 years old. Jordan Ware and Jonathan Salas talked about their reactions to the statistics of young people of color in the criminal justice system. “I kind of got upset about the fact that black and brown people we get way harsher sentences than Caucasian people in America. We all kind of feel that it is wrong for everybody else to be getting harsher sentences and they get a slap on the wrist,” Ware said. Salas added, “What shocked me was the statistic about how many kids go to prison for doing minor things and being charged as adults." Despite learning of these disparities, Ware and a third MPS student, Courtney Washington, said they walked away with a lesson. (From left to right) Courtney Washington, Jordan Ware, Jonathan Salas. “We have more power than what is portrayed in our lives and with different people,” Ware said. Washington said, “What I learned from this is, no matter where you come from you can still change the world and make a difference in your community, and it just starts with one person." 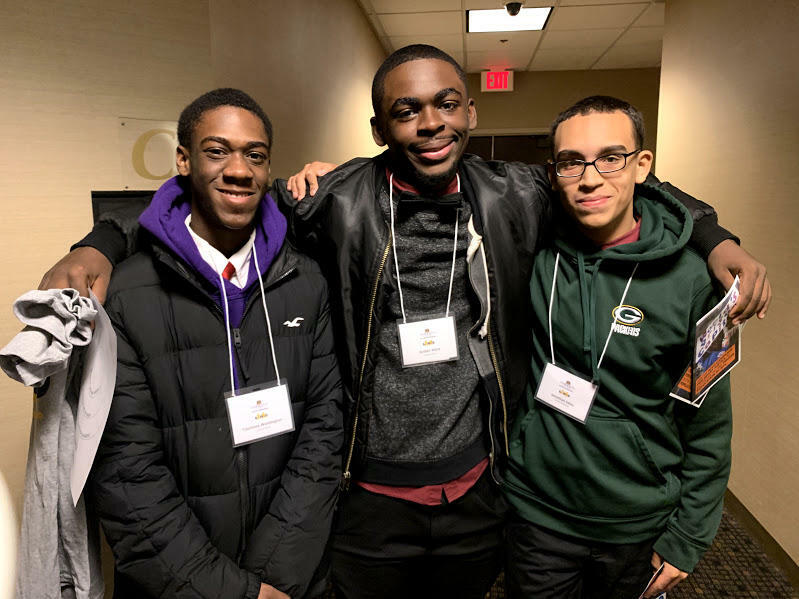 Summit officials say they hoped to create a brotherhood among young men of color in Milwaukee and help develop them into leaders who can create a city that looks different than the one that exists today. Milwaukee's Midnight Basketball League is wrapping up its latest season. But the program's impact on the lives of the players is much bigger than having a safe place to play basketball. On a recent Wednesday night, groups of young men filed into Bradley Technology and Trade High School on Milwaukee’s south side for the Midnight Basketball League. The first game of the night was set to begin at 8, followed by games at 9, 10 and 11. With less than 24 hours until Election Day, people still haven’t lost their momentum behind “get out the vote” efforts. Candidates campaigned throughout the state over the weekend. The rainy weather proved to be no obstacle for Milwaukee voters who gathered to cheer on Democratic candidates Sunday night. Dozens of people filed into the Coordinated Campaign South Milwaukee Office to hear from incumbent Sen. Tammy Baldwin, candidates for governor and lieutenant governor Tony Evers and Mandela Barnes, and candidate for state treasurer Sarah Godlewski. Young people in Wisconsin are helping lead the charge this election season with a message for everyone to get out and vote. Here in Milwaukee, that means going to door to door asking people if they plan to vote and providing voter guides with information on the candidates. Some of those leaders are young people of color. This past Saturday, dozens of high school and college students spent part of their weekend canvasing different neighborhoods to make sure people get out to vote. The documentary Circles highlights the need for juvenile justice reform — with a focus on one family's story. The film, which is featured at the Milwaukee Film Festival, follows school counselor Eric Butler. He does restorative justice work with youth in an Oakland school — giving kids that have dealt with the trauma of the system or their environment a safe space to be heard.